"Investigate Vault RAS-2 and investigate the source of the strange signal." The First Firewall is a Story Mission available in The Taken King. 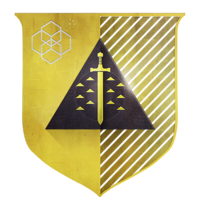 It is available once the player has turned in all four Dark Age Fusion Rifle relics to Banshee-44, and is the first mission in the Sleeper Simulant questline. The Guardian detects a signal coming from Bunker RAS-2 and quickly goes to the area where the signal is being transmitted. They then enter the bunker, and approach the interface in the Seraphim Vault, where there is a power outage. As the Guardian approaches the interface, numerous Knights spawn, and the Guardian is tasked with fending them off. After multiple waves of Knights are defeated, Kandorak, an Ultra Taken Knight, spawns along with numerous other Taken Knights. After Kandorak is killed, it drops a Curious Transciever and power is restored to the vault.